For superior value, high quality, and excellent service...go for the Gusto! 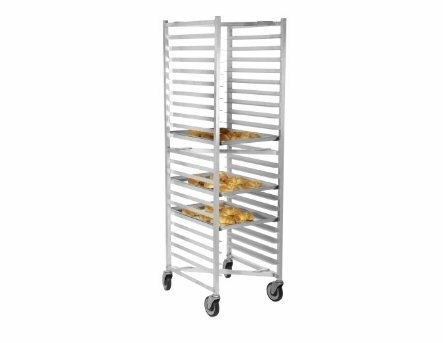 Maximize kitchen space with this full size bun pan rack from Gusto Equipment®. Economical and efficient, this bun pan rack offers the most value for your storage needs, especially in tight kitchen spaces. Efficiently store up to 20 full size bun pans on this durable sheet pan rack using the convenient end-load pan design. For superior value, high quality, and excellent service...go for the Gusto! Maximize kitchen space with this full size bun pan rack from Gusto Equipment®. Economical and efficient, this bun pan rack offers the most value for your storage needs, especially in tight kitchen spaces. Efficiently store up to 20 full size bun pans on this durable sheet pan rack using the convenient end-load pan design. If you have any questions about this product by Gusto, contact us by completing and submitting the form below. If you are looking for a specif part number, please include it with your message.